Vancouver, B.C. - July 24, 2012 - Corvus Gold Inc. (“Corvus” or the “Company”) - (TSX: KOR, OTCQX: CORVF) is pleased to release the final results from the 2012 phase 1 core drilling program that ended June 2012 at the North Bullfrog Project, Nevada. Final assays from hole NB-12-138 in the Yellow Jacket target area defined a thick mineralized zone around the previously discovered high grade vein (NR12-14, May 23, 2012) that has now expanded the overall intercept to 72.4 metres @ 1.74 g/t gold and 98.7 g/t silver or a gold equivalent* grade of 3.53 g/t (0.114 opt gold equivalent* over 237 feet), beginning at about 40 metres vertically below surface (Table 1). At the Yellow Jacket target the complete results from hole NB-12-138 has now outlined a thick, near-surface zone of high-grade mineralization which could expand the Sierra Blanca open pit deposit north in this direction (Figure 1). Hole NB-12-139 at the Yellow Jacket target, 60 metres north of NB-12-138 drilled through a fault into the distal footwall zone of the high-grade vein target intersected in hole NB-12-138 and intersected a high-grade quartz veining with 5.14 g/t gold over 1.5 metres. It also encountered extensive explosive hydrothermal zones indicating the target boiling zone lies below this elevation. These new intersections have opened up potential for defining a new, higher grade, bulk tonnage zone of mineralization to the North of the currently defined deposits. In August, a 3D induced polarization (IP) survey will be carried out over Yellow Jacket to evaluate the depth and continuity of this new high-grade discovery. Phase 2 drilling of the Yellow Jacket target is scheduled for Q4 2012, subject to drill permit issuance. Additionally, results from large diameter core drilling at the Mayflower Deposit has validated and enhanced earlier reverse circular (RC) drilling results. This drilling also intersected a massive quartz-adularia vein (Figure 2) which returned high-grade gold within a broader lower grade interval (54.4 metres @ 0.81 g/t gold including 1.1 metres @ 6.85 g/t gold). 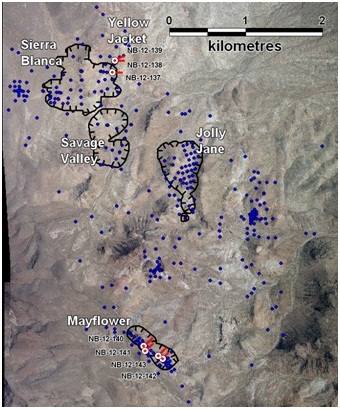 This intersection and the general higher grade nature of the core drilling over RC drilling results (Table 1) suggests higher-grade mineralization may be underrepresented in the Mayflower resource estimate where the current indicated resource averages 0.38 g/t gold (Technical Report and Preliminary Economic Assessment for the North Bullfrog Project, Bullfrog Mining District, Nye County, Nevada, February 28, 2012). The current phase 2 Mayflower infill drilling program will determine the extent of the higher-grade mineralization and result in an updated resource summary and preliminary economic assessment (PEA) in Q4 of this year. *Intercepts calculated with 0.1 g/t cutoff and up to 2.0 m of internal waste. The current North Bullfrog mine development program is focussing on infill drilling, advanced metallurgical work and environmental baseline characterization studies in conjunction with a completion of a feasibility study by early 2013 on the Mayflower deposit. The recently completed financing has now provided the Company with the financial resources needed to rapidly advance the mine development assessment of the North Bullfrog area as well as continued exploration of this major new high-grade Nevada gold discovery. Figure 2: Brecciated banded quartz adularia vein from NB-12-141, @ 116 meters. 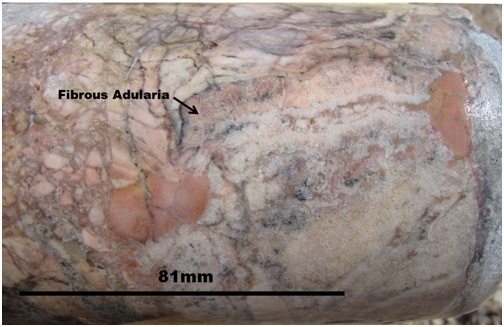 The banded texture of the pink adularia is commonly associated with high-grade mineralization in Bullfrog type gold systems. Corvus Gold Inc. is a resource exploration company, focused in Nevada, Alaska and Quebec, which controls a number of exploration projects representing a spectrum of early-stage to advanced gold projects. Corvus is focused on advancing its 100% owned North Bullfrog, Nevada project towards a production decision while continuing to explore for major new gold discoveries. Corvus is committed to building shareholder value through advancing new gold discoveries to production while leveraging noncore assets via partner funded exploration work into a portfolio of royalty and carried interests in its projects.